Welcome to MrKlingon.org MrKlingon's Drake Equation Calculator! Here's my attempt to build a calculator for the Drake Equation. For serious references: http://www.seti.org/ (where I borrowed the nice image of the equation, and background info). 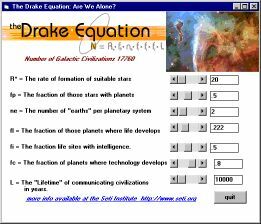 and Click here: http://www.seti.org/science/drake-calc.html for an online calculator. Need vbrun300.dll? Try this link!